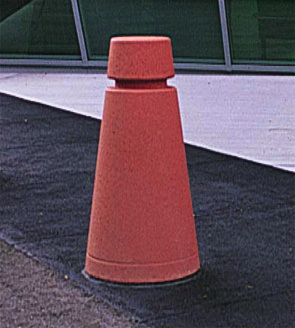 Provide an aesthetically appealing deterrent to traffic access with durable precast concrete pyramid bollards. Constructed with 3/8" steel rebar and measuring 34"H, top diameter of 9" sloping to the bottom diameter of 18" these concrete bollards meet all standards of ASTM C150, C31, and C33. Available standard in nine weatherstone colors and five exposed aggregate colors to choose from, these concrete bollards are also offered in custom ground glass concrete finishes that can qualify for LEED® points. Concrete Bollards must be placed on a flat stable surface that will not shift or settle such as concrete.